Summer calls for more relaxed eating and so we've been making lots of salads. When we received some beautiful beets from our weekly CSA delivery, I was inspired by this recipe. 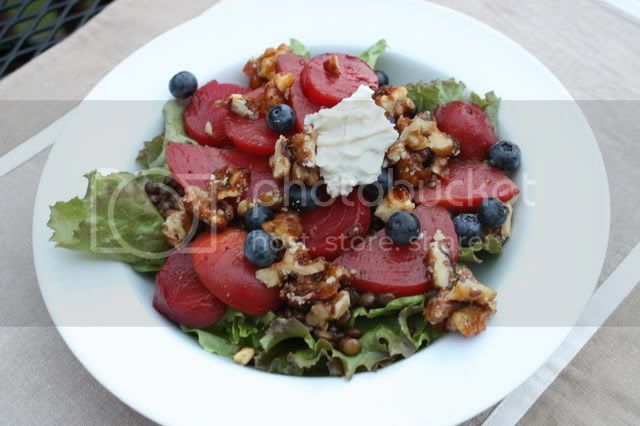 Lentils, goat cheese, candied walnuts, balsamic marinated beats and blue berries made for a light, and refreshing dinner. I could eat beets everyday and be happy! This looks delicious!!! whoa, I might have to make that right now! it looks delicious!